I just got back from being away for the weekend and realized I almost missed the deadline for Dawn's colour challenge. Here's what I came up with. I loved these colours. Hope you all had the best long weekend! OK----Seriously gorgeous colour combo! I wasn't too sure to begin with but I love how my card turned out. I was going to use some buttons but then I realized these gorgeous little mini crocheted flowers that Jewels made were PERFECT! I just received this adorable LOVE stamp from my wonderful friend Steph. Isnt' it great?! I just had to put it to use and this was the perfect card for it. Thanks for looking. Well I may not be a purple fan....and Dawn's already braced herself to take some grief about including that colour but~~~just. look. at. those. BUTTONS!!!!! I don't know about you but I think they might just be the thing to sway me and I can't wait to get my hands on ALL the new Papertrey button colours. I needed a birthday card for a friend (Happy Birthday Cristy!) and used Dawn's colour challenge for it. Whew....these were not easy colours were they? I think it was that red and green that took me for a loop. The stamps are both by Elzybells. The cupcake stamp is from the Mini Messages~A Little Hello set. So cute. I paper pieced the icing on each cupcake rather than colouring them in. The hb sentiment is one of my favs as I just love the font. Thanks for visiting everyone! Have a great day. Here's my card for Dawn's color challenge. I really enjoyed these colors together!! Thanks for visiting. 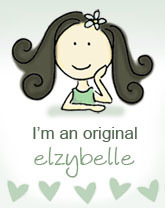 See you on Thursday for my Elzybells DT challenge project. Just a quickie post so I can get my color challenge card posted on to Dawn's blog. I have 4 friends who had baby girls in March so I thought this was a great opportunity to get one of the cards done that I will need. Here's a close up of the flower I made. As you may know I LOVE Primas Canvas Lollipop flowers and have them in several colors. You can see a green one in my post below. I made my flower using 2 of my favorite Papertrey colors.